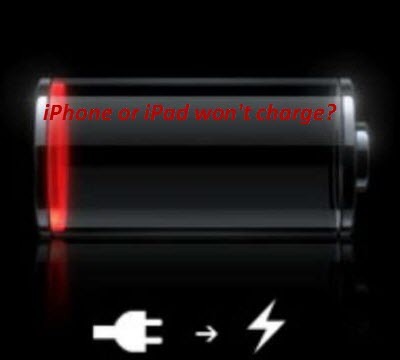 Have you ever encountered the trouble of iPhone or iPad won’t charge? Have you ever thinking about changing for a new battery? However, the iPhone's battery can't be replaced by the average user and you need to pay for that service along with the battery itself. So, before deciding to change for a new battery, there are still a couple of things you can try to fix the problem. This is the most common way to fix any iPhone problem, and it does work magically on fixing most iPhone problems.So you can give your iPhone a restart and try plugging it in again to see whether the trouble will be solved. If you are completely sure you are using the right kind of USB port,and still can't get a charge, it may be the USB port itself that's broken. To test this, try plugging your iPhone into another USB port on your computer or another computer. If the other computer or the other USB port can detect and charge your iPhone, it means USB ports on your computer is broken. In this case, things become very simple. Just change for another USB port or another computer whose USB ports all work perfectly. In terms of the hardware malfunction, the USB cable you're using to connect the iPhone to your computer or power adapter may be the trouble maker. You can test to prove whether it is the USB cable cause the problem by getting access to another iPhone cable and try using that one instead. If you find that it is your USB cable that's broken, you can buy a new one from many stores. If instead of plugging it into your computer, you're charging your iPhone using a wall charger power adapter it could be the adapter that's preventing your iPhone from charging. Just like with the USB cable, the only way to check this is by getting another power adapter and trying to charge your phone with that or you could also try charging via a computer instead. Sometimes problems occurring with your iPhone require more extensive steps to solve them. One of those measures is Recovery Mode. This is like a restart, but can help solve more complex problems. It's important to know that in Recovery Mode, you delete the data on your phone. When you use Recovery Mode, your phone will expect to have its data restored from a backup or to be returned to factory settings. If your iPhone still does not charge after trying all the solutions mentioned above, you may take changing for a new battery into consideration now.